Jockey John Marshall kissing Melbourne Cup trophy after his win on board Rogan Josh. Champion jockey John Marshall lost his battle against pancreatic cancer, passing away overnight. He was 60. Marshall is best remembered for his 1999 Melbourne Cup-winning ride on the Bart Cummings-trained Rogan Josh. Marshall formed a formidable combination with Cummings, particularly during the 1980s when he was Sydney stable jockey for the great trainer. Rogan Josh (c) ridden by jockey John Marshall wins the 1999 Melbourne Cup. He rode all of Cummingsâ€™s champions during that era including Beau Zam, Sky Chase and Campaign King. Marshall was the 1987-88 Sydney jockeys premiership winner with 86 wins. This was an outstanding achievement as he won the title in an era when Sydney racing boasted an outstanding group of riders including Ron Quinton, Mick Dittman, Malcolm Johnston, Darren Beadman, Jim Cassidy, Kevin Moses, Wayne Harris and others. 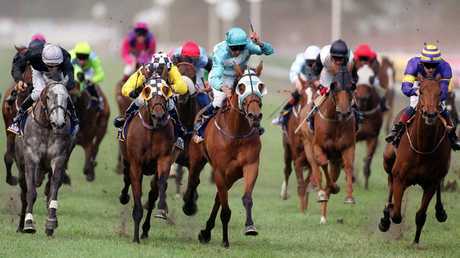 Marshall also rode successfully for a number of years in Hong Kong before returning home and recording his career-best win on Rogan Josh in the Melbourne Cup. His son, Taylor, is an emerging young jockey based in Queensland and rode five winners at Rosehill as an apprentice a few years ago.